This is going to be (probably) the most transparent blog I’ve ever written. It’s up close and personal and I’m not writing it to be pitied or felt sorry for, nor for comments to boost me up and make me feel good. I’m writing it because I think there are a lot of women out there who feel the same way but are hiding behind masks. I’m getting real, right here right now. I am lonely and I want to matter. My husband was away last week, shooting guns at Fort Shenandoah with about three thousand other men and women who like to dress up in Civil War uniforms and compete with their Carbines, Muskets, Maynard’s and other firearms. I called a Compadre of his and left a message to call home. He did. When he did he told me all about what was going on there and never once asked me how I was or was everything okay at home. Now, remember I requested he call me. That whole telephone conversation made me feel as though I didn’t matter. I work from home. I spend my days alone with a twelve pound dog, Sam. I talk to Sam – he does not talk back to me. You get the picture. When husband comes home from work, adult company is welcomed. I’m afraid TV gets his company, not me. I get lonely. And, I am determined we will fix these things. Think about the Samaritan woman who visited the well one sunny afternoon, at a time when no other village women would be there to ridicule her, because she felt as though she didn’t matter. She met the Living Water that day and her life changed. Readers, I don’t know why Holy Spirit woke me up this morning at 4:35 and said, “It matters – write it down.” But I know this, if you are lonely or feel as though you don’t matter to anyone – you matter enough to the Creator of the Universe to send His very own Son to be beaten beyond recognition and to hang on a cross beam with nine inch spikes driven into His hands and feet and to spill His holy blood for you – YOU MATTER TO HIM. You bet it matters. Don’t let anyone tell you that you don’t matter. Thank you for being so unmasked. Many years ago our son communicated with a woman in another state. He was interested in her daughter but she didn’t return the interest but her mother did. He would tell me of she & her husband’s on-going troubled relationship and finally she moved out, asked for a divorce and got it. But in the meantime, the husband kept asking, “Why?” “What happened?” I asked Chris how long this woman had been telling her husband they had a problem. The answer was five years. Five years. Many men don’t listen until it’s too late. It is a sad fact of life. By the way, this woman’s husband was the media director for the then largest Assembly of God Church in FL. He heard every one but his wife. It is my heart felt hope that your husband, my husband and many husbands read and think on what was written. Some marriages and lives will be saved if they do. Victoria, thanks for commenting. 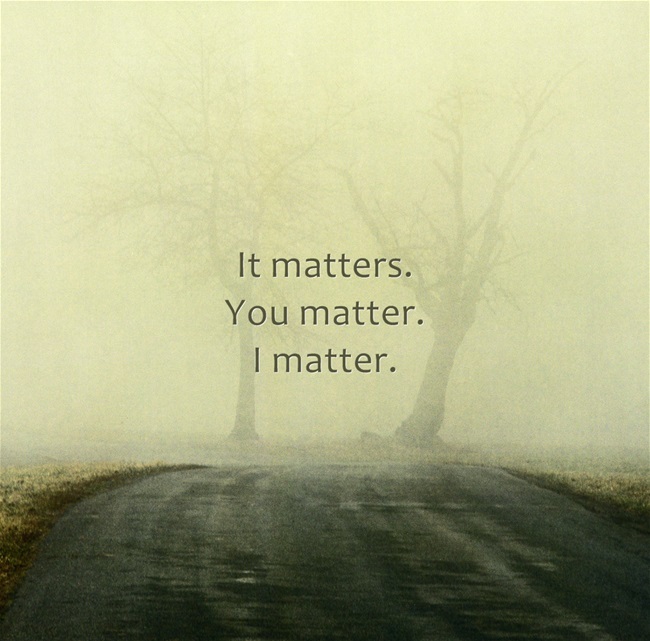 Yes, YOU do matter – we all do very, very much! One of my best friends just murdered her 10-year-old daughter, my daughter’s best friend, and then herself! My husband has been having an affair for years, but I finally told myself “I deserve happiness”, so I’m divorcing. I kept telling my friend that, “just think how happy you’ll be a year from now”! My heart is so broken at these senseless tragedies but it makes me love and reach out to my beloved friends even more! Life goes on … Love one another! Kathy, such sorrow for you sweet sister. May the Lord bless you and shine His face upon you and give you peace. Yes, we ALL matter to Him; otherwise, He would not have sent His only Son to die for our sins. We definitely need to be aware of the needs of those closest to us, and I thank you for bringing this to our attention today! God bless you for your openness! Love you! My heart is with you. You must have put yourself out on a limb to share this. But then that’s where the fruit is, yes? You are a courageous woman, and I am so happy to call you “friend”. You have described what most of us feel in some relationships at some time of our lives. I think about our Lord and how he must experience “not mattering” to so many of his children every day. So is this part of discipleship? To carry a little of His cross? Sometimes I wonder, but don’t have all the answers. I just know that you, Susan, definitely matter to me and I am so glad you are my at least my (parttime) neighbor. I will pray for you both and your relationship. WOW! You have hit it on the head. Men truly are waffles (they can only work out of one box at a time). They are the axis of their universe-but maybe that is so they can hyper focus on the task at hand, be it work, fighting off the mammoth or building the home. If they multitask as we do, they would probably never get things done 😉 They’d be too worried about who would be affected and how, how this project would bring about another…how to schedule it all, and care about the hearts involved. You matter. We matter. Above all others, we matter to the Most High God. Sing grateful praises for there is no greater joy! All these relationships constantly change-but His love never changes. Thank you,Lord! I have been there. I have said those words. I have had that conversation: “Something has to change.” I know what it feels like to sit there in tears feeling like you could be gone and no one would miss you. Then, one day in my prayer time,I told God that I release it all to HIM. I was tired of trying to change my husband, my marriage all by myself. Looking through my past journals, I realized I was the one who was changing. I released my husband to God. I know we are soul mates and this marriage is of the Lord. It is HIS to work through. I am thankful he is here. I am thankful he does love me. In clinging to the Lord, He has been working through my husband. One thing my husband shared with me: get his attention before talking. Call his name. Keep him focused. If I don’t tell him I need him to listen, he will just talk. He acknowledges the waffle concept. ‘God fingerprint’: One time, when I was up home, I called him. After hearing all about his day, and he thought the conversation was over, I said, “Speak to my heart”. Suddenly, the whole mood changed and he told me how much he loved me and missed me. My prince was still in there-just covered up by life. 🙂 God is so good. Be encouraged. Know you are loved. Thank you for your honesty. We all need to be more real with each other. At this point in my life, I want real, honest relationships with my ‘sisters’ so I can grow in Christ and in my calling. Love you,Friend! WE ALL MATTER TO OUR LORD AND SAVIOR. HIS LOVE NEVER CHANGES. AS FOR MEN—–SOME EXPRESS MORE THAN OTHERS. THEY ARE WIRED SO DIFFERENT THAN WE WOMAN. THEY WON’T EVER ASK FOR DIRECTIONS!!!!!! I HAVE BEEN BLESSED BEYOND BELIEF AND GOD HAD A HAND ON THAT FOR SURE. WE GIRLS JUST HAVE TO STICK TOGETHER SOMETIMES WHEN WE ARE FEELING LOW. LOOK TO THE HEAVENS AND SMILE, IT WILL HELP WITH A PROSPECTIVE SOMETIMES. HUGS AND HAPPY FALL. Wow! I can tell by the responses that this touched so many of us. There is a deep loneliness inside each of us that cannot be satisfied by surface relationships, so we search for the real thing. The Lord is the real thing and He leads us to others with whom we can be real and transparent, who accept us for who we are and lovingly encourage us to be more. Your blogs reach our hearts and reveal that we are not alone, although we may be physically alone during our days, there are sisters in heart who are out there feeling the same things with whom we can relate in Spirit. Thank you for providing the place where we can join together. Yes we do matter, very greatly to God. For He so masterfully, thoughtfully and lovingly created each and every one of us to be the way He wanted us to be. He loves each of us more than we’ll ever be able to comprehend and that is key. He gave us His only son Jesus, and Christ died so that every single one of us would be able to have a close, personal relationship with God, our Father.. Then He gave us the Holy Spirit to dwell within us, to be complete with Him. We are a part of Him and He is part of all of us. We all together along with our Father, Jesus and the Holy Spirit combine into a huge beautiful powerful force. And if I’m really “plugged in” my life seems supernatural and beautiful and filled with love. Thanks for posting this blog, you are a beautiful and special person whom God loves and delights in. Bless you. You are a brave woman Susan…you just stepped right out there….good word. Yes…we all matter. We matter greatly….but I would never let lack of attention from my husband define me. My life is made up of choices. I made a choice to stay…with that choice comes accepting my man for what he is and what he is never going to be. Knowing full well to keep my expectations low because he is a man….I can spend quality time with him. My life is full….my Lord, my family and friends complete me along with my husband….I am blessed….I MATTER. I am woman, hear me roar! Love what you wrote Sandy B. AND, agree wholeheartedly. Christ defines me – I would never expect that from a husband! Blessed, we are!